Jaded Blossom: Let Love Grow! Jamie here and I have a tag to share with you today using this month's Spotlight- Seeds of Friendship! 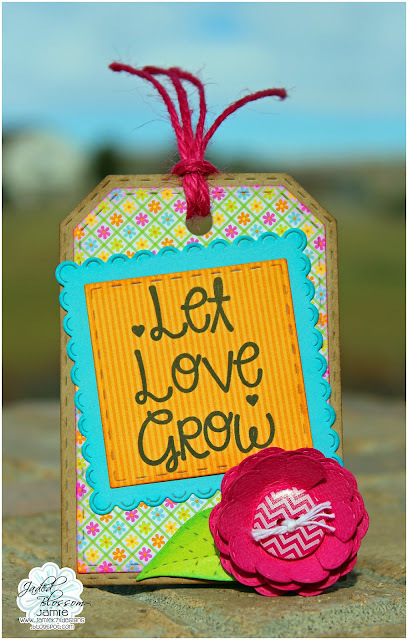 I stamped a sentiment from Seeds of Friendship onto a Stitched Square Die and layered it on a Scallop Square. Then I created a flower with the Spring Dies by cutting slits and layering 3 cuts. I added them all to the top of the Luggage Tag Die. So pretty! Love the papers and colours you used! I loved the creativity! I am totally inspired by your design! love the creativity and the cool work. Great inspiration for me. Thanks for sharing. This is one of the most pretty stationary element I found today on the web. It is lovely to see such a creation. In a similar way several designs of beautiful Indian wedding cards can be found online as well. Such a beautiful and lovely card. Indian wedding cards present designer wedding invitation cards.